After five seasons, the groundbreaking Switched at Birth TV show bid fans farewell in the memorable Freeform TV series finale, “Long Live Love.” But the question remains, is there still demand for season six? Take our poll and tell us what you think. 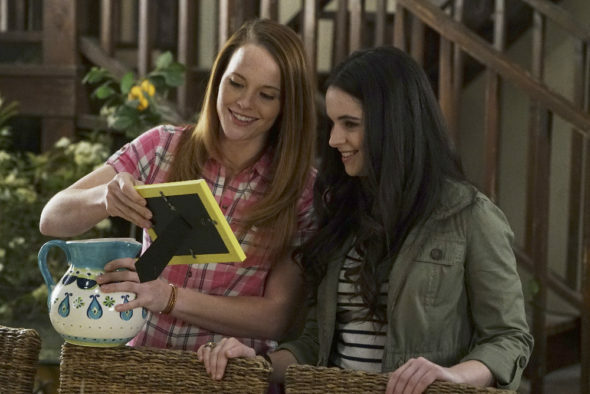 A blended family drama on the Freeform cable channel, Switched at Birth stars Katie Leclerc as Daphne Vasquez and Vanessa Marano as Bay Kennish. The cast also includes Lea Thompson, Constance Marie, Ryan Lane, D.W. Moffett, Lucas Grabeel, Rachel Shenton, Sean Berdy, and Marlee Martin. In Switched at Birth, episode 5.10, “Long Live Love,” creator Lizzy Weiss wrapped a bow around this family love story. Because Switched at Birth was cancelled after the fifth and final season was already well into production, she perhaps didn’t have as much time as she (and fans) would have liked, but did her best to set each character on a path toward the future. In an interview about the series finale, Katie Leclerc and Vanessa Marano told TV Guide they’re open to revisiting Switched at Birth in the future. Similarly, Weiss told The Wrap that she intentionally left the door open for a TV series reunion or revival. Still, we want to know if you would have watched Switched at Birth season six. Please take our poll and sound off, in the comments. In “Long Live Love,” when Kathryn (Thompson) realizes it has been five years since the Kennish and Vasquez families learned Daphne and Bay had been switched at birth, she decides to put together a display of all their mementos from that time. While searching for photos and articles, she finds an envelope addressed to John (Moffett). In it are lab results which prove Bay is not his biological daughter, and what’s more — they’re dated prior the family discovering the switch. Although at first Kathryn is angry with him for not telling her he suspected he wasn’t Bay’s father, she eventually realizes he was willing to remain in that role, and married, even though he (incorrectly) concluded Kathryn had been unfaithful to him. This storyline cements the already solid Kennish marriage. Meanwhile, Daphne and Mingo (Adam Hagenbuch) are both up for the same paid sports medicine internship. When Mingo finds out the doctor refused to even consider Daphne’s qualifications, because she is deaf, he wants to turn down the job. Daphne encourages him to take it and teach the doctor some tolerance and acceptance. After realizing they’d both been pretending to still be involved with other people, in order to protect their pride, the couple reunites. Also, the tattoo Bay gave to Emmett (Berdy) is featured in an edgy Live Ink magazine spread. The publication hosts as party to launch the issue, and Bay makes a connection which will help launch her career. Meanwhile, Travis (Lane) has landed a spot on a professional baseball team — in Japan. Although he doesn’t want to leave Bay, he cannot pass up this opportunity. Because she doesn’t want leave, just as she’s advancing professionally, Bay convinces Emmett to go with Travis, which will give the two chosen “brothers” a chance to mend and strengthen their bond. Elsewhere, Toby meets Amelia (Lauren Potter) a young woman with Down Syndrome who serves as a caretaker to a man (Casey Powell) who is also living with Down Syndrome. This encounter gives him new found hope in the possibilities open to Carlton (Casen D. Lyon). Back home, he tells Lily (Shenton) that he’s decided he wants to work as an advocate for people living with challenges. In other news Melody (Matlin) reverses her decision to take the job at Gallaudet University. She decides to stick with the program she’s created at UMKC and the local kids who need her. Finally, since she’s still in love with Eric (Terrell Tilford), Regina (Marie) breaks things off with Luca (Michael Galante). After talking to a lawyer, she convinces Eric to turn himself in. The lawyer believes Eric will only have to serve a couple of years in prison. Regina, who is moving back to East Riverside, will take care of his son, Will (Sayeed Shahidi) in the meantime. When Eric is released, then they can finally be together. The episode concludes with a family party at the Kennish home. John, Kathryn, Toby, Lily, Carlton, Regina, Daphne, and Bay all reminisce about the past five years, talk about the future, then go out and lie down on the front lawn, to wait for the appearance of a once in a lifetime comet. What do you think? Did you watch the Switched at Birth TV series finale? How did you like how it all played out? What would you have changed? More about: Freeform TV shows: canceled or renewed?, Quick Questions, Switched at Birth, Switched at Birth: canceled or renewed? Switched at Birth: The Ending You Didn’t See and Could There Be a Revival? I would love to see like a hundred more seasons and would also love to see Bay and Emmett tie the knot and get married. I would also like to see Daphne overcome her obstacle for med school and become a surgeon and also for her to be with Mingo. Would also love to see Mingo and Daphne have kids. Another thing I would love to see Eric get out of prison and have kids with Regina and start their life again happily together. Very inspiring, looking forward to Classes in ASL. Really hope to see more of this show. Also would like to see some shots done in St. Louis. I loved the TV show and would have loved to see it continue after series 5 . I also thought the ending was a bit lame , need to bring it back so we know what happens with all the cast in their future endeavors you have left us all wondering , I could not get enough of this series , its the best love all the cast , please bring it back asap . Still hope he shows up and sweeps her off her feet. This show was the best because of the two girls. Katie and Vanessa on screen was comfort food for the eyes, I didn’t care for the way the writers kept throwing them under the bus though, along with Toby. Bay was best off to end with Ty or Travis, Emit was only good for the puppy love stage of her life.